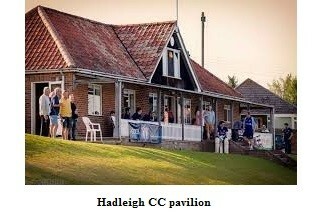 Another cricket club has been blighted by a proposal to create housing next to the boundary, but this case involves the eminent Suffolk club Hadleigh CC and the district council offices. It is almost beyond belief that Babergh District Council are driving through a plan to convert their old offices into housing, bringing them into conflict with one of their prize local community assets, safety being the key contention. The top prize in the Wisden-MCC picture of the year competition for 2018 has gone to an Australian. A new play about the former England all-rounder Chris Lewis starts touring this week. The time has come for a timing clock to appear on electronic scoreboards. All club cricket should be played as 20 overs to increase participation. Mike Atherton will be pleased that women's centuries and five-wicket returns. Burglaries and vandalism is a routine hazard for so many cricket clubs. The knighthood for Alastair Cook was richly deserved in the New Year's Honours list. The father of a spin scholarship winner enjoyed his CCC lunch at Lord's last week. The law makers at the MCC have bowed to common sense. Andy Sandham, Mitcham CC's most famous player, is one of the county cricketers from the First World War. Minor counties will be hosting a professional county for one match from 2020 onwards. The chairman of the Club Cricket Conference is still fuming, and I don't blame him. Club cricket in Surrey received due recognition at the Cricket Writers Club awards. This was a proper final between two equally matched teams. Hardly possible, one might have thought, to steal the thunder from Richmond. A massive fraud by a trusted official has pushed a cricket club in Durham close to extinction. The Purnell CC bowler who has been banned for nine matches by the Somerset County League. Crazy Catch - Christmas Offer!